In 2009 members of the Winnipeg Police Service Ground Search and Rescue Unit trialed various types of technology that was publically promoted for the purpose of tracking high risk wandering persons. The trials involved two forms of technology, GPS based and electronic frequency tracking (EFT) equipment similar to the technology adopted through Project Lifesaver International. Although both GPS and EFT equipment had their merits, in the end the reduced battery life of the GPS based unit(apx 3.5 days on tested model), loss of signal inside buildings, dependency of computers and cell phone towers, inability to have the equipment on the vulnerable person 24/7, the lack of provincial, national or international coverage and the number of providers that were operating for profit resulted in the GSAR Unit coordinator advocating for the EFT equipment. Through 2010-2011 the WPS GSAR Unit continued to test the EFT equipment which included a standard 30 day Project Lifesaver Transmitter and an LSI-G2 Receiver Unit. The ease of maintaining the equipment and training members to use the equipment also proved to be assets. Numerous discussions occurred with Project Lifesaver International as well as Canadian agencies that already had their own Project Lifesaver chapters. A history of Project Lifesaver Manitoba would not be complete without heartfelt thans to Inspector Rick Derus of the Ontario Provincial Police, Constable Aileen Nixon; the former Project Lifesaver Coordinator for the York Regional Police Service and Trisha Conner; Director of Training Support – Project Lifesaver International. The biggest thank you goes to Nancy Arenburg and her husband Ron from Project Lifesaver Nova Scotia, who provided advice, direction and support to Manitoba as we went through the planning process for Project Lifesaver Manitoba. In 2011 support from several SAR related agencies in Manitoba resulted in the Search and Rescue Manitoba Volunteer Association (SARMAN VA) submitting a grant request for a Search and Rescue New Initiatives Fund Grant (SAR NIF). The successful grant submission, strengthened by the in-kind contributions made by the Winnipeg Police Service and the Winnipeg Search and Rescue Volunteer Association, resulted in Project Lifesaver Manitoba being created in the spring of 2012. 2012 was a development year for PLMB. Registration of the name, opening a bank account, ordering equipment was “taking care of business”. Two of our board members attending the PLI Conference in Las Vegas demonstrating the sacrifices they were willing to make to ensure success of the program. In September Project Lifesaver Manitoba hosted Barry Paluk and Denise Wallace from Lakehead Search and Rescue – Ontario Search and Rescue Volunteer Association, as they taught the first Electronic Search Specialist Basic and Instructor courses at the Winnipeg Police Academy. 2013 will be the year of the first PLMB clients being signed on and hopefully the success in the Winnipeg area will result in expansion into other areas of Manitoba. Our biggest challenge will be to identify a community partner to assist us with direct contact with our new clients. 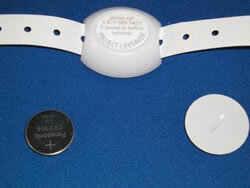 Assistance with changing batteries and bracelets, collecting inspection forms and testing the bracelets is an extremely important part of the PL program and as of February 2, 2013, a partner has not been identified to fill this role. Stayed tuned for future updates as Project Lifesaver Manitoba continues to move towards our official introduction to the general public!